Huntington Beach is a tremendous location as a seaside community with all of the amenities of Orange County. Homes for sale throughout Huntington Beach enjoy a Mediterranean climate, which offers sunny, dry weather nearly year-round. The community has a variety of beach bungalows, recently constructed Mediterranean style homes, condominiums and townhomes available, ranging in scope from the affordable home for a family or individual to the first-rate luxury of the finest in SoCal beach living. Homes for sale in the downtown area of Huntington Beach are located literally within blocks of the Pacific Ocean, and can offer spectacular ocean views, beautiful pier views, and scenic vistas with views of the city lights at night, depending on where the properties are located in the area. In addition to the individual real estate options, there are a number of high-end, gate-guarded communities for high-end living. These communities will include Seacliff on the Greens, Seacliff on the Boardwalk, and Sea Cove at the Waterfront. Combining this natural climate with the westerly and southwesterly winds in this area, Huntington Beach becomes a picture perfect city in which to live. Huntington Beach has been named among the ten safest cities in the United States and provides top-notch community services to its citizens. The city was originally founded in 1904, and its visionary founders, Henry E. Huntington and J.V. Vickers, hoped to turn the Huntington Beach area into a large, seaside resort. Essentially, they were planning on a Pacific Ocean version of Atlantic City on New Jersey's shore. The original vision of Huntington and Vickers was derailed in the wake of the discovery of oil in this area, but the community has gone on to thrive just the same! 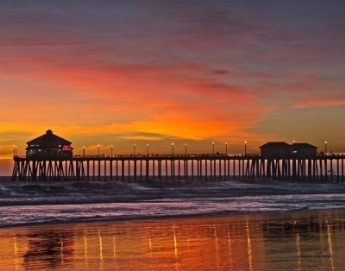 Today Huntington Beach is recognized internationally as "Surf City" and is the hub for surfing in Southern California. In addition to the excellent surfing and the cultural Mecca that the area has become for surfers, Huntington Beach real estate is also now one of the best places in Orange County for excellent outdoor activities. The beaches here offer such pastimes--and full-fledged sporting events--as surfing, sailing, volleyball on the beach, fishing, tennis, golf, and others. Those who are more interested in relaxing can also take full advantage of the area to simply enjoy a sunny day at the beach. Others will enjoy the large crowds that gather to watch professional sporting events such as the U.S. Open of Surfing, AVP Pro Beach Volleyball, and the Surf City USA Marathon. Huntington Beach offers something for everyone, as evidenced by the incredible wealth of tourist activity! 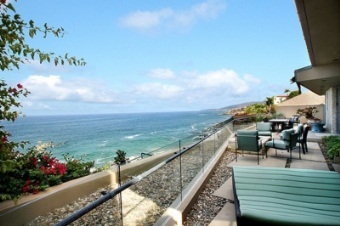 Millions of visitors flock to this portion of the Pacific Coast every summer, seeking a small sampling of the views and lifestyle that the residents can enjoy year-round. of scenic, accessible beachfront. This is recognized as the longest area of uninterrupted beachfront on the entire West Coast! There are two state beaches in the area, Huntington State Beach and the aforementioned Bolsa Chica State Beach. A number of other points of interest in and around Huntington Beach will include the harbor, protected wetlands, the wildlife preserve, Central Park, and tremendous shopping options at Bella Terra or the Old World Village. Dog-owning residents are generally very pleased to learn that Huntington Beach actually features a Dog Beach, where individuals and their canine best friends can enjoy some fun in the sun together--in a specially-designated area of the beach, no less. The City of Huntington Beach offers a variety of community activities and events for its residents and visitors throughout the year. Many locals and visitors turn out annually to enjoy the Kite Festival each February. Another favorite is the Cruise of Lights boat tour scheduled during the winter holidays, which involves a parade of colorfully lit boats as well as boat tours of the many colorfully decorated ocean side homes. Of course, the annual U.S. Open of Surfing is a huge draw for surfing fans worldwide. Throughout the entire year, another community event is known locally as "Surf City Nights." These exciting events feature a local farmers' market, varieties of entertainment, excellent food, and a carnival atmosphere each Tuesday evening! There is never a lack of things to do in Huntington Beach, whether it is enjoying a quiet weekend at home watching the surf, or walking, biking, or skating along the local ocean trails. The Huntington Beach City School District (HBCSD) is responsible for the public school needs of the community, and provides excellent instruction for children ranging from pre-school through renowned middle schools. There are seven elementary schools in the HBCSD, and older children will attend one of the two public middle schools: Issac L. Sowers Middle School or Ethel R. Dwyer Middle School. High school student needs are administered separately from the younger students, through the Huntington Beach Union High School District (HBUHSD). This school district covers high schools in and around the Huntington Beach area. Most of the public high school students in the city will attend Huntington Beach High School, which offers first-rate college preparatory studies. There are also a variety of private schools in the area, offering everything from Montessori pre-school classes to private, religious or secular schooling for families who desire these educational options. If you would like further information or assistance regarding Huntington Beach homes and the fine available houses for sale throughout Huntington Beach, please contact our team.